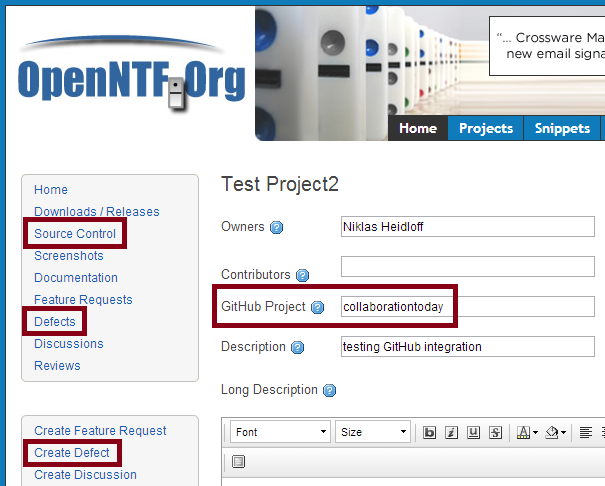 As we blogged about, OpenNTF developers can use GitHub to collaborate on OpenNTF projects. In this case GitHub is used as source control system and as defects tracking system while OpenNTF provides the ability to store project releases, screenshots, documentation, etc. We've extended the OpenNTF project management application to be able to refer to GitHub projects. When project owners choose this a new 'Source Control' entry shows up in the left navigator that points to the GitHub project. Additionally 'Defects' and 'Create Defect' point to the issues on GitHub. Try the sample project. We've also continued to work on other website improvements, for example we fixed an often reported bug in the screenshots carousel. We've reduced the amount of pages from 80 to less than 40 now and except of registration everything is now implemented as XPages in one NSF. This makes later changes much easier.